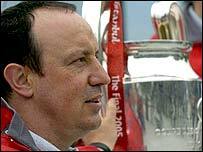 Liverpool boss Rafael Benitez admitted he was amazed by his side's dramatic Champions League win over AC Milan. "My problem is that I don't have words to express the things that I feel at this moment," he said after the match. "At half-time we knew we had to change things. You concede one goal in the first minute and it is very difficult, then we lose Harry Kewell. "It was very difficult, but the players believed and won. Steven Gerrard is a key man, he has the mentality we want." Jubilant skipper Steven Gerrard added: "We were massive underdogs at the beginning of the competition and I'll put my hands up say and I didn't think we were going to go all the way. "But, as you can see, we are never beaten. "The manager told us to keep our chins up, to try and score early in the second half and give some respect for the fans. The first goal gave us a bit of belief." And the Liverpool-born midfielder paid tribute to the club's supporters. "The supporters have saved up for weeks and months to come here," he said. " I am so happy to lift the cup for the fans." Jerzy Dudek made a point-blank double save to deny Andriy Shevchenko late in extra-time. And the Poland international saved from Andrea Pirlo and Shevchenko during the penalty shoot-out as Liverpool won the competition for the first time since 1984. "I don't know how I did it," said Dudek of his save to deny Shevchenko in extra-time. "It was fortunate for myself that I did it. Fantastic for me. "I was waiting for this moment. I had difficult moments in this game but this is fantastic." Central defender Jamie Carragher was jubilant after another towering performance. "It is one of the greatest finals of all time," said Carragher. "We were all deflated at half-time. We knew we had to get the next goal and we knew we had to push up. "When we got the goal Milan just seemed to go. 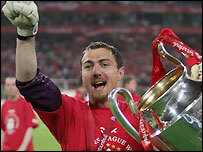 "The save Jerzy Dudek made from Shevchenko at the end was unbelievable. I can't believe we've just won." Liverpool's Spanish midfielder Xabi Alonso, who broke his ankle in January but recovered in time to play at the end of the campaign, admitted he was in shock after the triumph. "This is the best moment in my professional career. I am a European champion, and I cannot believe it. "It is slowly sinking in. It's unbelievable, but I think as the hours progress, we will be able to absorb what we have achieved. "I know there is always a first time, and fortunately this was mine."